My goodness this album had balls. It was something really quite unique in 1975. Female artists didn't do this sort of thing. Yes, Janis Joplin had sung the blues with the best of them, but she was long gone. Suzi Quatro played the glam game but Patti Smith was something quite unique. Punk before punk existed, she dressed like a man, cursed like one, sang with a sneer and a lascivious leer of a voice. She really was quite iconic. She pre-dated punk/new wave by a year here, almost seeming to anticipate it. There is a convincing case for this being one of the first true punk albums. Her cover of Van Morrison's "Gloria", with her own added lyrics - "Jesus died for somebody's sins but not mine..." has an in-your-face punky energy that never lets up for a minute. The original was good, but this is surely the definitive version. The reggae-tinged and mysterious "Redondo Beach" continues the beguiling quality before the first of the stream of consciousness pieces in the "poem set to music" of "Birdland". 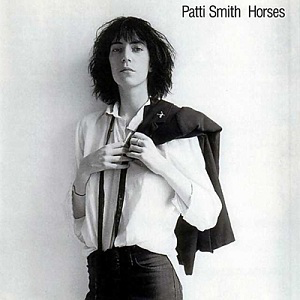 Patti narrates her poetry over a stark, grandiose piano backing before being joined by some searing guitar that surely David Bowie was influenced by for his "Heroes" album three years later. I have to admit that it is an acquired listen and it grates just a little by the end of the track, but that still mustn't be allowed to detract from its brilliance, and its remarkable imagery. "Her eyes were just two wide opals...". By the end of it you feel that Jim Morrison had a daughter and here she was. "Free Money" is a piano-driven slow burning rock number, with a rumbling bass line and some haunting vocals. There is some muscular rock guitar and drums on it, particularly when the tempo kicks off after a while, in a Velvet Underground fashion. It ends in a crescendo of rolling, rattling drums and Smith spits out her lyrics with yet more pure punk energy. My favourite has always been the thumpingly insistent, powerful and seductive "Kimberley", with its killer organ swirl and guitar. Smith's vocals on this are superb. The wailing guitar-driven "Break It Up" is excellent too, almost anthemic in its chorus. 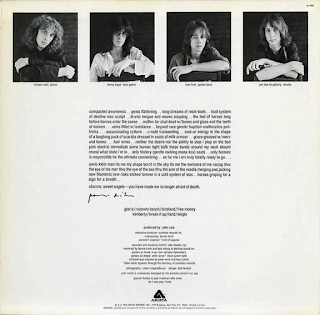 The closer, "Land", is the other stream of consciousness track, the equivalent of The Doors' "The End". This is an exhilarating track. When Patti sings "do you know how to pony, like Bony Moronie..." and the riffy guitars kick in it is one of the best moments on the album. For 1975, it is an incredibly adventurous, ground-breaking piece. When Patti rants away near the end you know just what Siouxsie Sioux was listening to in late 1975/early 1976. "Elegie" is a sombre, mournful, dare I say elegiac end to the album. The Velvet Underground, The Doors, David Bowie, Lou Reed's solo material, The New York Dolls. They are all in here but the result is something palpably unique.